POLICE OFFICERS ON WEDNESDAY MORNING ARRESTED A LAWYER, OLUKOYA OGUNGBEJE, AT THE FEDERAL HIGH COURT IN LAGOS. OGUNGBEJE HAD REPRESENTED THE ALLEGED BILLIONAIRE KIDNAPPER, CHUKWUDUMEME ONWUAMADIKE, ALIAS EVANS, BEFORE QUITTING EARLIER THIS YEAR. POLICE OPERATIVES SAID TO BE FROM THE STATE CRIMINAL INVESTIGATION DEPARTMENT, PANTI, WHISKED THE LAWYER AWAY AS HE PARKED HIS CAR AT THE FEDERAL HIGH COURT IN IKOYI ON WEDNESDAY MORNING. THE EMBATTLED LAWYER WAS BILLED TO APPEAR BEFORE THE VACATION JUDGE, JUSTICE MUSLIM HASSAN BEFORE HIS ARREST. IT REMAINS UNCLEAR WHY HE WAS PICKED UP BY THE POLICE, ONE DAY AFTER A LAGOS COURT RULED THAT THE CASE WAS READY TO GO TO TRIAL. 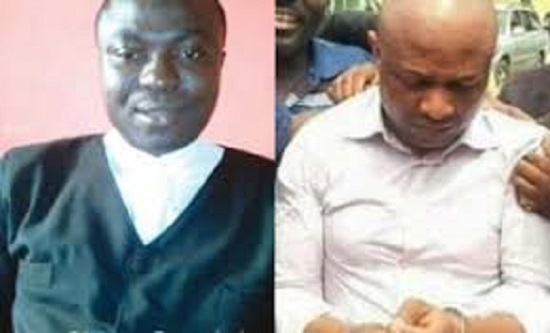 0 Response to "Billionaire Kidnapper Evans’ Lawyer, Ogungbeje, Arrested"